Chalk Paint: Is It All It's Cracked Up to Be? Is chalk paint really that good? It's a question I've pondered for months now. "It's the best thing since sliced bread!" "This stuff is a life changer!" "It so amazing it can cure world hunger!" If you've been anywhere in the proximity of a DIY enthusiast or Pinterest in the past few years, then you have probably heard all of the rave about Chalk Paint®. As always, I was late to the party and just recently tried out a version of "chalk paint" for the first time on Pearl, my charming little Craigslist find. Obviously, after completing my first solo project using this stuff you can now qualify me as a "chalk paint" expert. Ah, not happening, you say. You're right, I'm not an expert which is why I want to preface this post by saying I'm not an expert. Phew...now that we got that cleared up let me go ahead and share my experience with you. As I mentioned in my post here, Chalk Paint® is not to be confused with chalkboard paint. Chalkboard paint can be applied to pretty much any surface to create a reusable writing surface. Ya know, school? Chalkboard? Yeah, that thing. I used chalkboard paint on this little Goodwill table that I used in the playroom. Chalk Paint® is a specialized type of paint that is actually trademarked by Annie Sloan (hence the federal "R" trademark that's slowly taking over this post! ), however, other companies have since then jumped on the bandwagon and created their own versions of "chalk paint". 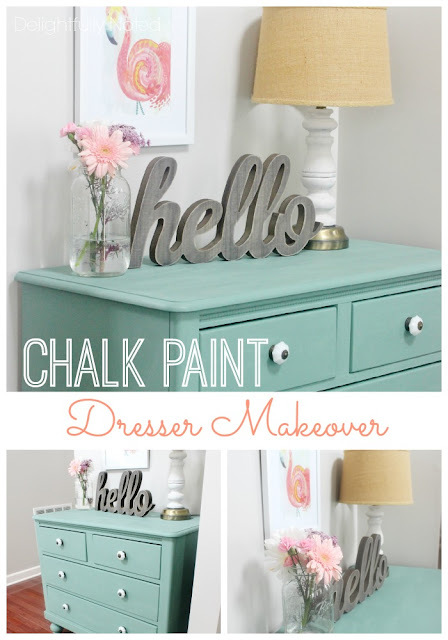 There are also a slew of DIY "chalk paint" recipes online as well. It's finish is often matte and chalky-like (although sans the annoying white, chalk dust) and it's very popular among the world of furniture "distressers". I used a similar item from the Martha Stewart line, called Vintage Decor Paint which is their version of chalk paint.... but remember there's that little trademark thing with Annie so they don't call it that. that I used as the "chalk paint wannabe". (This is all starting to become way more complex then I intended it to be! Why don't we all just pause and pour ourselves a glass a wine). So enough beating around the bush! Let's get to the meat of this story. Did I or did I not think "chalk paint wannabe" was all it's cracked up to be? TIME: The big draw to this type of paint is that there's no need to strip, sand, or prime or your furniture prior to painting. Obviously, anything that allows me from doing extensive labor and promises to save me lots of time gets an A + in my book. Unfortunately, I didn't find that the chalk paint wannabe gave good coverage and bear in mind my furniture piece was originally white, so it's not like I was attempting to cover black or something dark. A matter of fact it took me five coats of paint to cover this bad boy. Yes, FIVE coats. Did I mention you also have to allow your piece to dry for 2 hours between coats? Now I've never claimed to be a mathematician but I'm pretty sure the time it took me to paint this thing five times ( a whole week!) was more time consuming than just sanding, priming and painting with regular ol' latex paint. Heck, I could have watched all six seasons of the Good Wife and painted Pearl in this amount of time! Durability: Chalk paint wannabe doesn't stand up to wear and tear. This is probably the part that I am the saddest about. After Pearl had dried, I was standing back and admiring her while my hubby replaced her drawers. That's when I started to notice the paint was chipping. Mind you, he did slightly struggle with getting the drawers back in but it's not like he was alligator wrestling them. I've noticed the paint wearing away in other spots too. Fortunately, we always enter our house through the garage so it's not like our entry way sees a lot of foot traffic. We won't be slamming keys and phones down on Pearl but still it's disappointing to take a whole week to paint something to have it start falling apart. If you Google around you'll find that this tends to be a common problem with chalk paint. Waxing: When I set out to paint this dresser, I knew I would have to follow up the chalk paint wannabe with wax. I actually didn't find that process to be daunting like other users, however, what I didn't realize until afterwards was that you're suppose to wax your piece approximately every six months! If I'm not good about changing my bed sheets every week (don't act like you are! ), then I'm sure as heck not going to wax a piece of furniture every six months. In regards to the pros, I actually did like the look of the finish product (minus the chipping), it's got a creamy, smooth texture to it. It's nice sometimes to not always have shiny looking furniture. I can't say that I will swear off chalk paint wannabes forever but I definitely don't think I will ever use it on large size furniture again and I'm not sure I will ever splurge on the real thing (Annie Sloan's paint runs $36.95 a quart ). I do think it would be great for smaller pieces of furniture or items that aren't touched a lot. Ya know, things that are just there to look pretty! large clock that I'm hoping to update soon. So there you have it, my experience with chalk paint.....errrr should I say a "chalk paint wannabe". As I mentioned, I am NOT a paint expert and obviously this was only my experience with one brand. I know sometimes blogland can come across as all rainbows, cotton candy, and sweet, sweet unicorn farts, so I just like to share my honest experiences with my do-it-yourself projects. I know lots of people who swear by this stuff and sometimes you just have to try things out for yourself! UPDATE: So since this post, I have decided to give another brand a go because you know, second chances, y'all! I'm excited to say I have had MUCH better luck with the brand "BB Frosch". It's actually a powder you can mix into any latex paint. That, in itself, is a HUGE plus considering I always found most chalk paint collections to be limited in colors. I'll share an updated post soon but it seriously has been a pleasure to work with! So I'd love to hear have you tried chalk paints before? What are your thoughts? Love it? Hate it? I'm with you on the taking forever to get one of these types of projects done I gave up after two coats on a tiny side table I got at a yard sale. I'm ashamed to say it still sitting in my garage unfinished. I didn't know you had to wax it that much. Crazy and no my bed sheets don't get done once a week. I wish lol. I absolutely love this dresser. I ended up here from Pinterest and have been looking at your blog for over an hour. You have so many beautiful projects (although this one is still my favourite of what I've seen so far). I'm following now. I'm way late to your post but I'll add my two cents. I have used two brands of chalk paint now: Cottage Paint and Country Chic. I have loved them both. I finish them with a light coat of poly (not wax) and have found it to be perfect for dressers! Glad you found a brand that works better for you. I love that you don't have to sand down furniture to paint! I'm also glad I found your blog, you have adorable things!